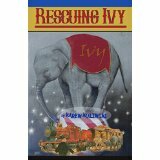 It is with great pleasure that I announce the launching of my writers group friend and cohort Karen Kulinski’s RESCUING IVY. This middle grade historical novel, inspired by a true story, is the tale of a girl and the elephant she loves. Danna’s late-night visit with Ivy, the circus elephant, results in the animal being wrongly condemned to death for killing a man. When nobody believes the girl that Ivy is innocent, she sets out to save the elephant herself, teaming up with a circus boy, her older brother, and two hoboes. Karen kicked off her launch Sunday, March 20, with a circus-themed party for which several members of our TaleBlazers writers group were present. TaleBlazer Writers Group members celebrate the launch of RESCUING IVY. From l. to r., Peggy Reiff Miller, Peggy Archer, Katie Mitschelen, Karen Kulinski, Mary Ann Moore, Fred Longenecker. Photo courtesy of Karen Kulinski. Elodie is a dutiful daughter and sister. Elodie is a reckless, romantic stowaway. Elodie is a brave plant hunter. Where does she truly belong? Two great books by two of my great writer friends!